How should international law approach the critical issue of movement of peoples in the 21st century? This book presents a radical reappraisal of this controversial problem. Challenging present-day ideas of restrictions on freedom of movement and the international structure that controls entry to states, it argues for a new blueprint for international migration policy that eliminates waste, aids both developing and developed societies and brings attendant benefits to voluntary migrants and involuntary refugees alike. In a world of increasing disorder, it is suggested that current policy only adds to international instability and threatens the interests of a functional global community. 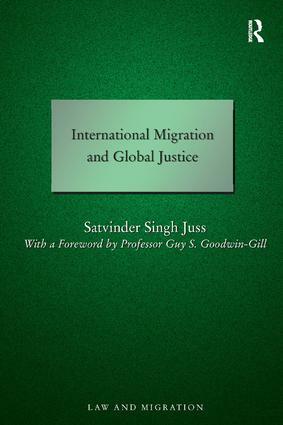 Professor Satvinder Singh Juss Ph.D (Cantab) FRSA, teaches international refugee law and human rights law at King's College London, UK, where he is also the Director for the Centre for Transnational Law, and a former Human Rights Fellow of Harvard Law School,. He is a Barrister-at-Law of Gray's Inn, who has appeared in human rights cases in the Supreme Court,the House of Lords, and the Privy Council. He has acted as an expert on human rights issues for various think-tanks such as Encounter, Rowntrees Trust, the Royal Society of Arts, the International Organisation for Migration, and lately the Centre for Social Justice, where he is currently engaged in a landmark inquiry into human trafficking and slavery. Professor Juss was the British Expert at the 2nd Conference of Ministers of Justice on the EU Rule of Law Initiative for Central Asia in Tajikistan in 2010, and seeks to combine the roles of teacher, practitioner, and activist in policy-oriented work. Migration and its subsets of refugee and asylum policy are rising up the policy agenda at national and international level. Current controversies underline the need for rational and informed debate of this widely misrepresented and little understood area. Law and Migration contributes to this debate by establishing a monograph series to encourage discussion and help to inform policy in this area. The series provides a forum for leading new research principally from the Law and Legal Studies area but also from related social sciences. The series is broad in scope, covering a wide range of subjects and perspectives.